Emily found a Groupon last February for an art class for children at a local studio. They do a 2-hour instruction for children teaching the children how to draw an animal (each class they do a different one) and then paint it with acrylics. Hannah has always expressed an interest in art, so we agreed that this would be a good birthday present for her. Hannah being shy in new situations wanted me to go with her, so I did and was able to take some photos with my phone. There were 11 children ranging 6-10 this week learning how to draw a giraffe. Hannah had a wonderful time! Before the class began, the teacher had paper, pencils and Sharpies laying out on the desks so the children could draw while they waited. Hannah has been watching a bit of Cake Boss on Netflix with mom lately, so she wanted to draw a zoo cake with a bottom layer of flamingos, middle layer of zebras and top layer of pandas, of course (above in the first 2 pictures). 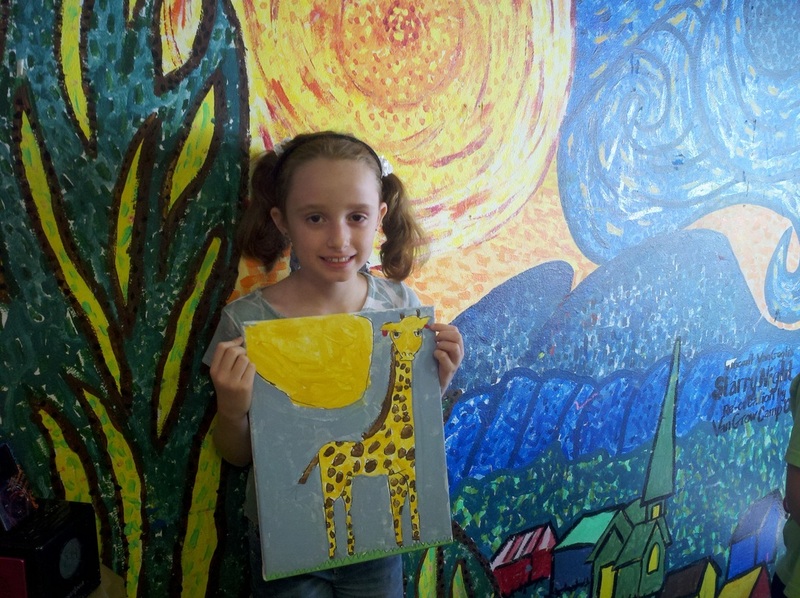 As you can see in pictures 2-9, Hannah drew and then painted the giraffe entirely by herself. The picture below is Hannah with her finished artwork standing in front of one of the walls on the studio - a recreation of Starry Night, Hannah's favourite painting.